What's the Idea Behind Earning Gold and Silver in Your Business? How Does It Help You? Your customers will notice this and will get very curious. A link under each price discount label (in case of online offers) will refer them to a page on your site (similar to this one) which we will provide to you on request. That page quickly and effectively explains why you offer this discount and how they can take advantage of it. Once they actually go ahead and create and fund a digital precious metals currency account, you can rest assured they will come back to your site and take advantage of your discount and offer. Next time they want or need to buy any of the products they know you offer, they will check in with you first to see if the same discount is available. That guarantees repeat business for you. You may even draw significant business away from your competition! You keep the gold and silver you earn and build up a nice stash over time. Print up business cards with your store's logo or name and the discount logo above. On the card, provide the URL to your store web site where an explanatory page similar to this one is located. 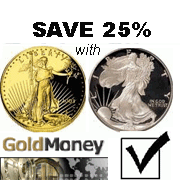 Learn how to use this web site to calculate any change to be given to customers for their gold or silver payments, and instruct your cashiers how to do the same. It's really easy! You only need a computer by your cash register. Sit back, collect your gold and silver American Eagles coins, and know that you are gaining an invaluable asset that promises significant gains over time without spending a dime out of your own pocket (other than for the signs and business cards). When the dollar breaks down, your customers will also have something to live on - and so will still be able to buy from you. Imagine what will happen if your doing this catches on. Let’s say your customers ask every other merchant or service provider they buy from if they will offer the same discount and option to pay in gold or silver. Those businesses that follow your example will make their own customers curious - and so on, etc., etc. The more businesses offer this option, the more customers will become aware of it, and the more opportunity you will have to earn precious gold and silver from other businesses’ customers. The more businesses and individuals accumulate PM, the more their price will rise as a result of natural market forces of supply and demand, which will increase your and your customers’ wealth position. The rising value of gold and silver over time will allow you to actually lower your PM prices, while monetary inflation will continue to result in price inflation, making the dollar prices of your goods or services go up. That will get your customers thinking even more. The increased pubic awareness of the true function of gold and silver as currencies, and of the inherent price stability and security they confer, will increase public pressure on elected officials to repeal legislation that inhibits the free circulation of precious metals as currencies. The last paragraph reflects what US Representative Ron Paul wants to achieve with the two bills he introduced before Congress: The “Free Competition in Currency Act” (HR 4683), and the “Honest Money Act” (HR 2756). Please support these two crucial bills by informing your elected officials of your desire to do so HERE. This threat is real. It is not to China's advantage to cause a sudden, catastrophic crash of the dollar - but it is to its advantage to slowly divest itself of this dollar overhang. But the result will be the same! By earning gold and silver, you can insulate your business from the inevitable ravages of this process.